Ahh snakes, my favourite animal category after tiny dogs... just kidding. 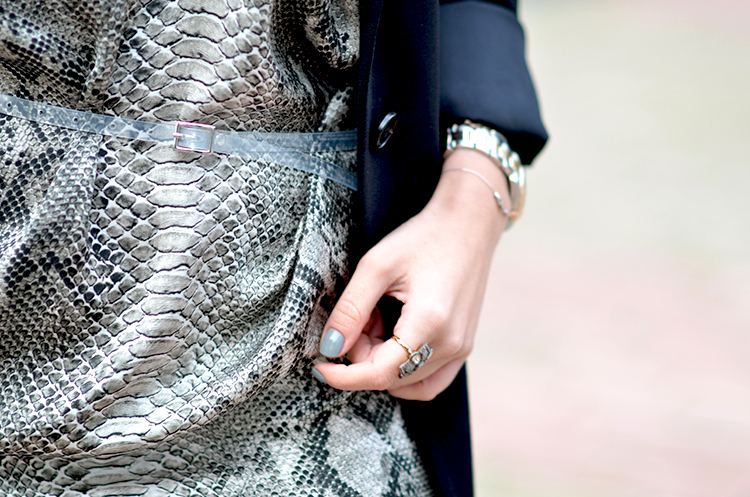 However, I am a big fan of animal print and that sort of includes everything snake. There's something feminine about it, but in a seriously classy way, which I don't know if you agree, but may or may not be the case with leopard prints. My choice of designer shouldn't take you by surprise, you know I have a long standing love affair with Stella McCartney (case in point being this and this). I guess I am a bit inclined towards british fashion designers, but you have to agree her designs are genious and worth every penny. I used to have a Spinish language teacher who said everything should come in threes. Of course he meant grammar and such. But, what could be more fun than to test if this rule was applicable to more than just grammar.. Putting on a snake print dress, led me to a snake clutch, which led me to a cuff with a snake on it (which together with the ring are part of a beautiful collection coming to you soon). One outfit, three serpents. Too much, or just enough? Speaking of cuff, remember the one with the elephant? Come to think of it I keep a whole animal kingdom in my jewellery box. Which one do you prefer? Thank you Ula! I feel like ankle booties have replaced all other kinds of shoes for me lately! wow! you look amazing dear!! Thess model is amazing !!!! Love the shoes too ! Let come to see my new Post !!! I wait you :-D Kiss from Italy ! Gorgeous dress and beautiful bracelet. thank you MJ, its a fav!